Balsamic vinegar of Modena as a Christmas present? No more lacks of ideas for the most suitable gift: this year you will be ready and, furthermore, you will make the difference. As every year, here it comes the best time of the year. Lights and musics are everywhere and as much closer to the exact date we get as much excited and overwhelmed we become. Christmas is the best period for sharing moments, thoughts and foods together: sitting with families and friends around the same table is something loved by everyone. Every year, tables laden with different foods bring together traditions and news recipes, which share memorable places on Christmas’s day. Each family has its own typical menu for this special day but there are no doubts that we all have that auntie who, year after year, comes up with a new starter based on tofu, or a new creative dessert with an exotic topping… but this year you can be the one who will have the winning ingredient! 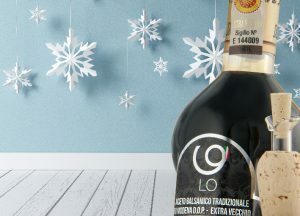 Balsamic vinegar of Modena DOP is the touch of uniqueness you are searching for. Easy to recognize but difficult to forget, it is the perfect ingredient: from appetizer to dessert it can suit your recipe down to the ground. By checking our blog, you’ll be able to prepare mustache-licking foods, so that your auntie’smango topping will turn out to be old-fashioned. Balsamic vinegar of Modena as a Christmas present. It will not only boost your confidence in amazing your relatives but also can be a unique and creative idea for all those friends, or family members, who are difficult to fulfill with the perfect Christmas present. This Christmas… Be unique and surprise your family! Buy the real taste of Modena or help your friends to achieve tops results in the Christmas’s menu, by gifted them the best Balsamic Vinagre quality.